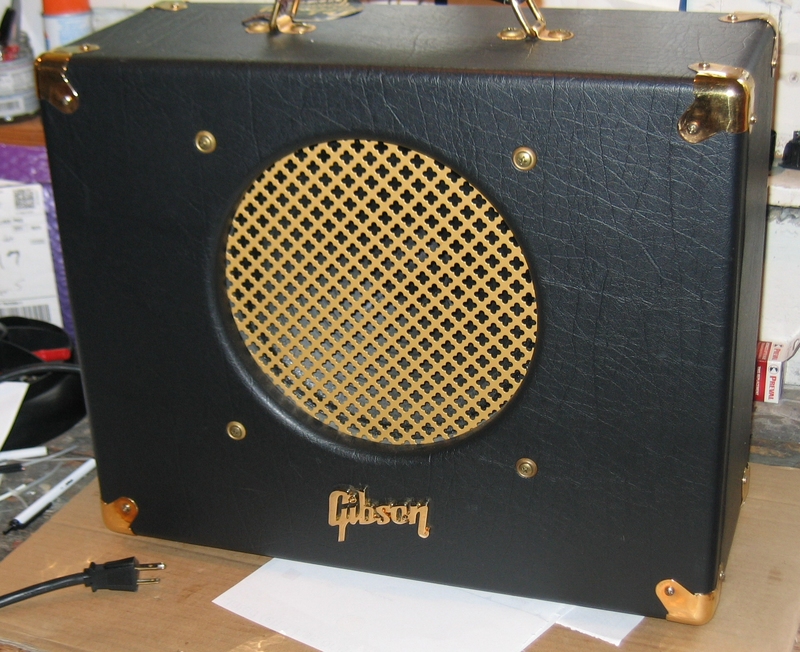 Category Archives: I just worked on a …..
Gibson Goldtone GA-15 in the shop! 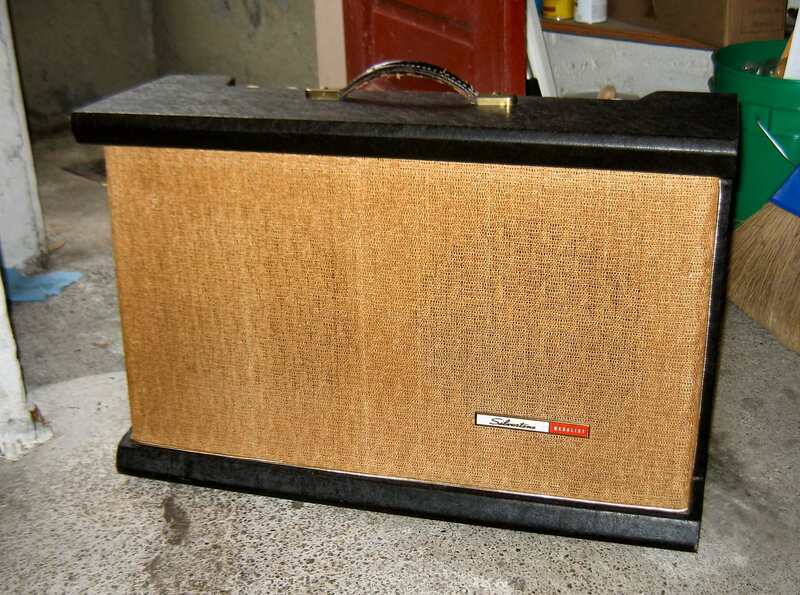 Nice amp, this one had some pretty bad vibration problems. Certain notes made the laminations in the power supply transformer vibrate loudly. So, we installed a new (higher-quality) power supply transformer. That did the trick, but now that the Power supply transformer is so quiet you can hear the output transformer vibrate! Now we’ve got the amp pretty darn quiet, in terms of vibration! ** By the way, GA-15 is identical to the Trace Elliot Velocette. 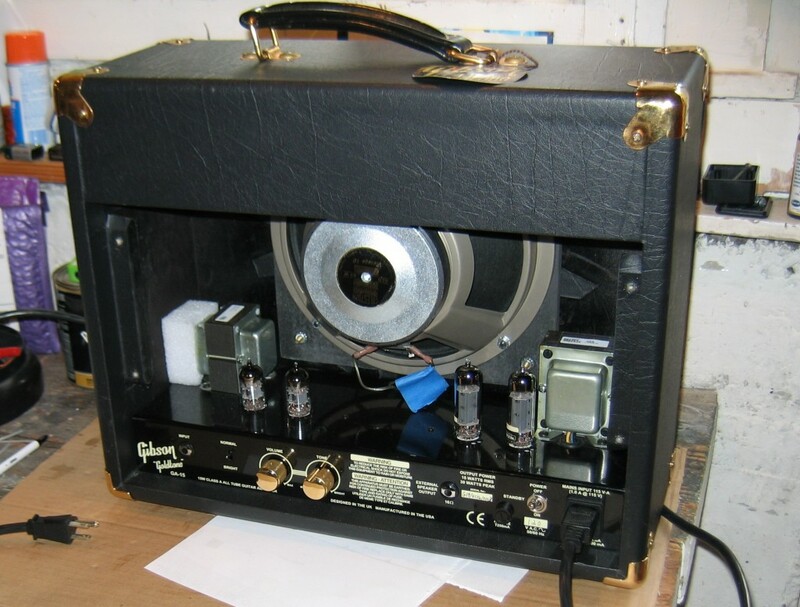 The Gibson circuit board inside this amp even says “Velocette” on it! 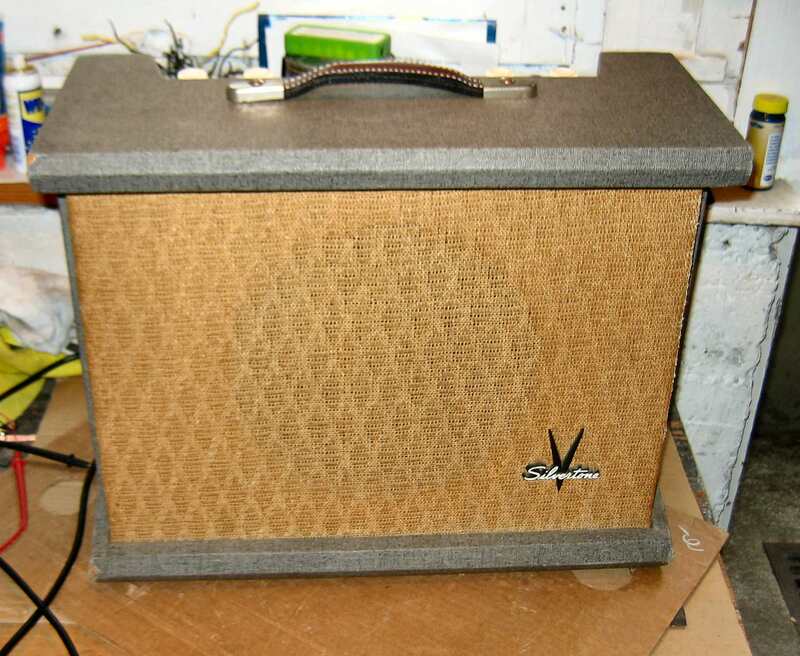 1971 Fender Super Reverb in the shop! A “Silverface” (with a “Blackface” replacement control panel) landed in the shop a couple of days ago. Well actually, we had to haul it up the steps, and down the steps into the shop! be tha tas it may, the amp shad some serious hum in the reverb and some microphonic behavior during the first two minutes of operation, after which it quieted down. But the amp seemed to lack clarity and clean headroom. This amp is owned by a Mr. CD Woodbury. 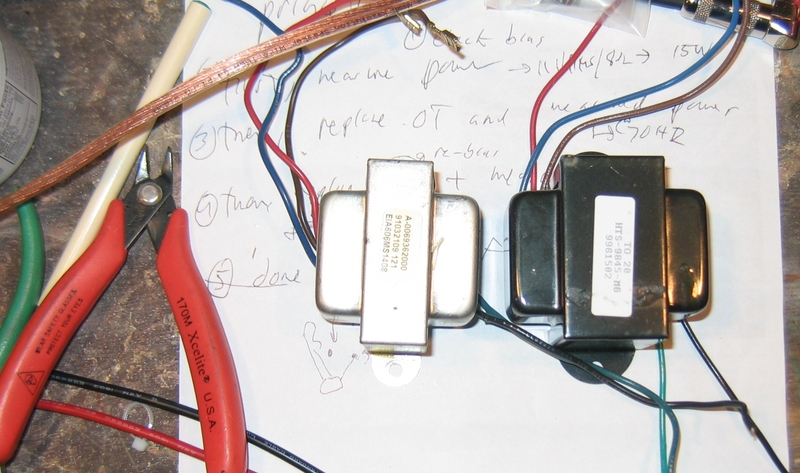 I’m installing a new output transformer into Tim Lerch’s Princeton Reverb re-issue. 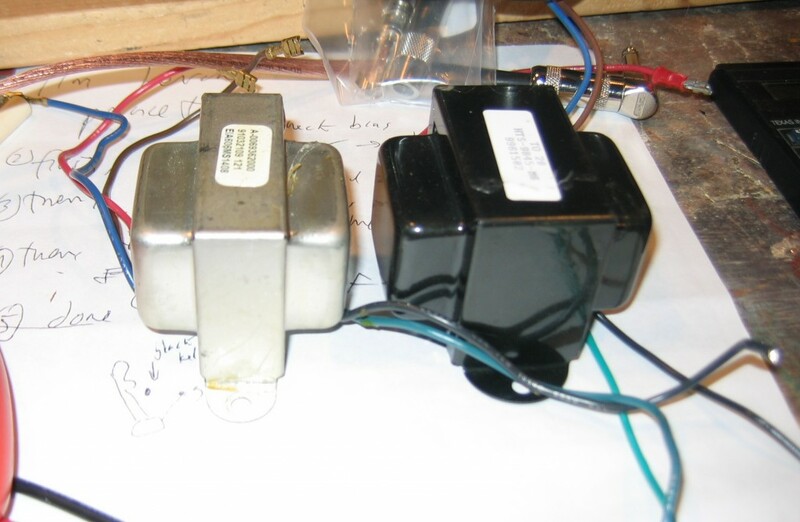 The new output transformer is an Allen/Heyboer “TO-20.” It’s a much beefier part compared to the stock OT (see photos below, new OT is black, stock is silver)). I also installed a larger-valued power supply filter capacitor for the main supply voltage. As a result, the amplifier holds together a bit better at higher volumes. Plus, I think the new OT makes the amp a bit more articulate. Another Blues Jr. in the shop. 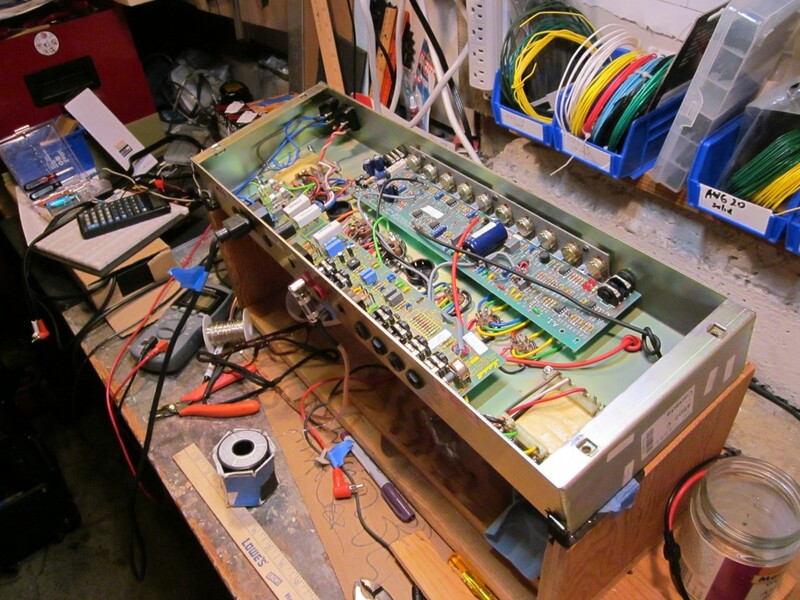 Lots of distortion – and, after some investigation: bad solder joints where the power tube sockets mount to the PCB. I have seen quite a few Blues jr’s with this exact problem. 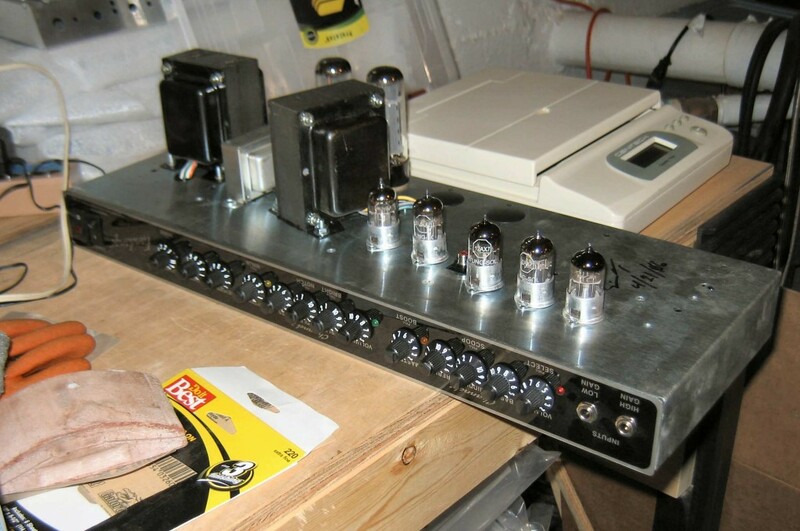 Two: Fender designs the amplifier with a bias that runs the power tubes (EL84’s) at 100% just sitting there at idle. This generates a lot of heat, thus further exacerbating problem # 1. Some speaker swapping, a pesky intermittent tremolo problem and weird power-up noises! Blackface Super Reverb in the Shop ! Fender Super Reverb, Blackface era….who couldn’t love an amp like this? !! This one has gone its entire life (so far) without any of the electrolytic capacitors having been replaced. The end result is lots of hum and the amp is lacking some kick. 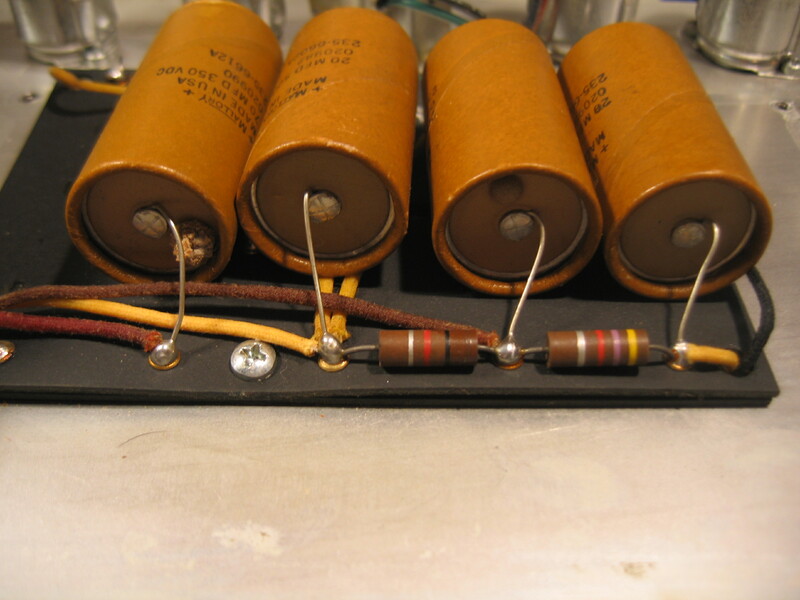 Look at the power supply caps (see photo below) you can see that one capacitor (farthest left) has oozed-out some electrolyte, and another cap (2nd from right) has a “pimple” that is about to pop and do the same thing – oooze out electrolyte. This amp is going to sound so much (SO MUCH) better once the power supply is working properly! Can’t wait to here it then! 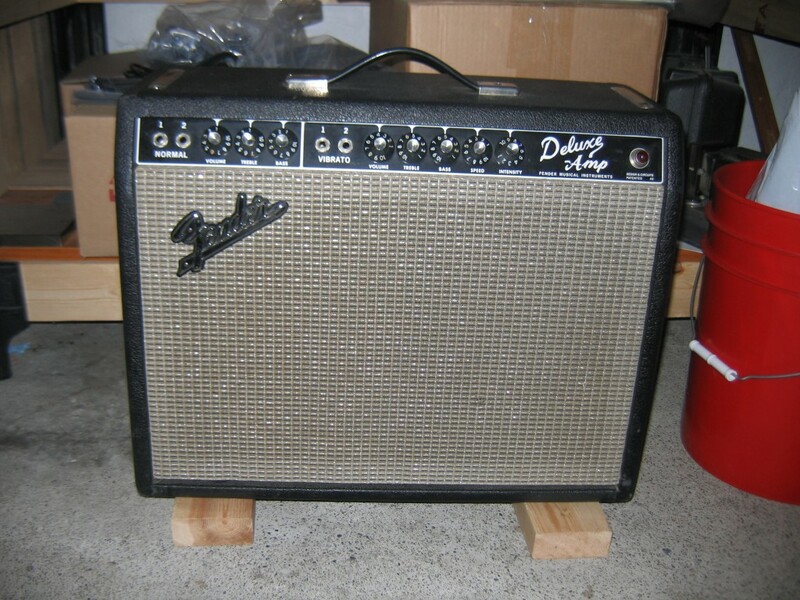 Fender Super Reverb in the shop! 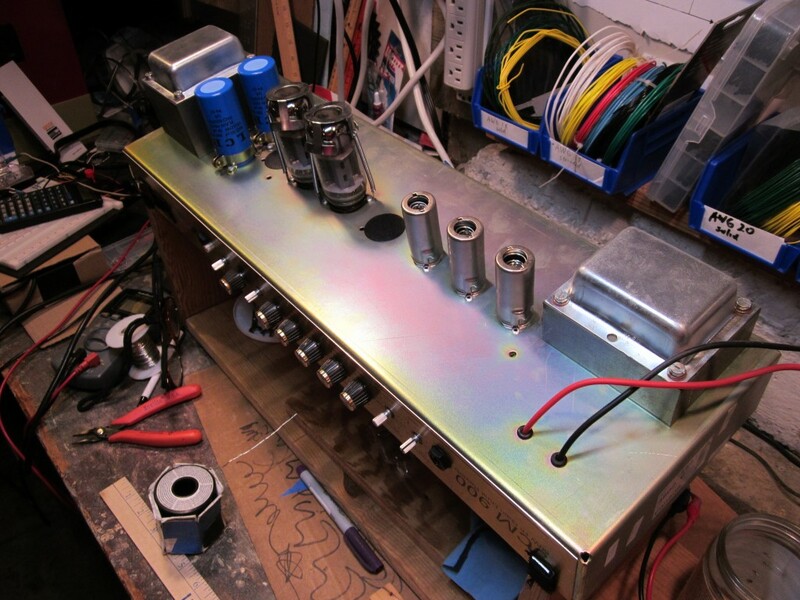 A silverface super reverb walked into the shop today…..Underneath the chassis I found very old, factory-installed electrolytic capacitors. Probably at least 40 + 5 years old. These have got to be replaced! Plus, instead of a Super Reverb spec’d output transformer the amp has a Twin Reverb output transformer. Who the heck bolted that on there? 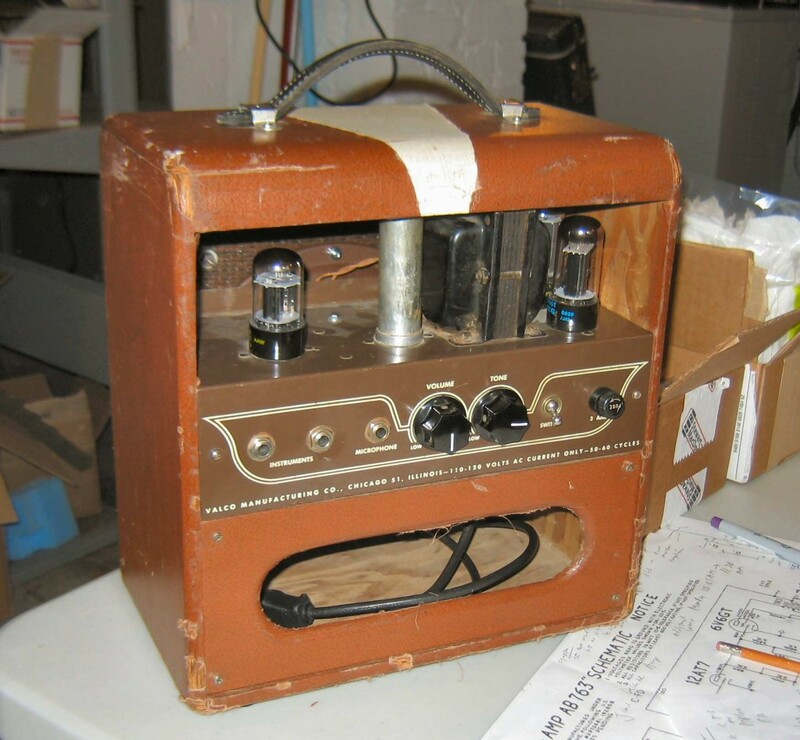 A lot of things happens, and doesn’t happen, to guitar amplifiers over the years. Sometimes, mods happen, and routine maintenance doesn’t. I hope to get this amp into great shape. 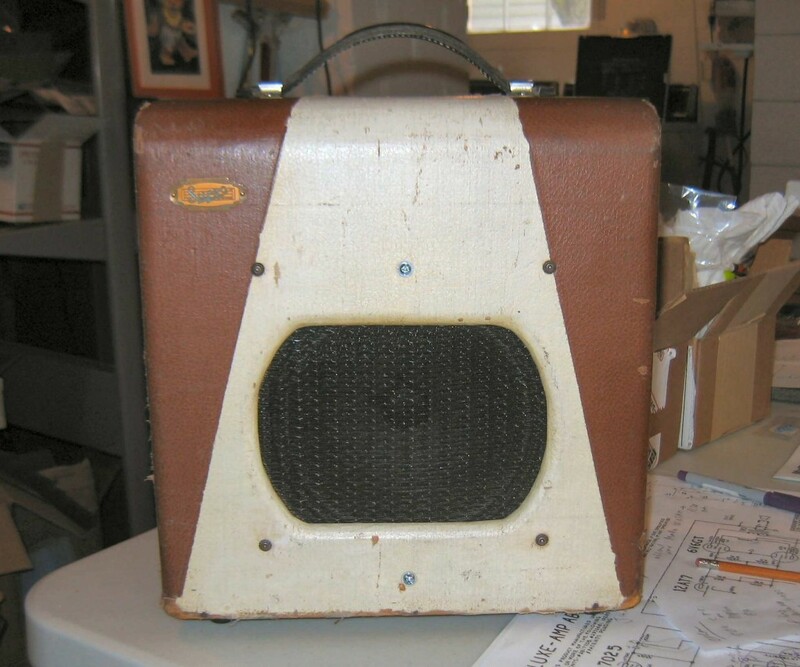 It has potential to be a wonderful guitar amp..just needs some TLC. 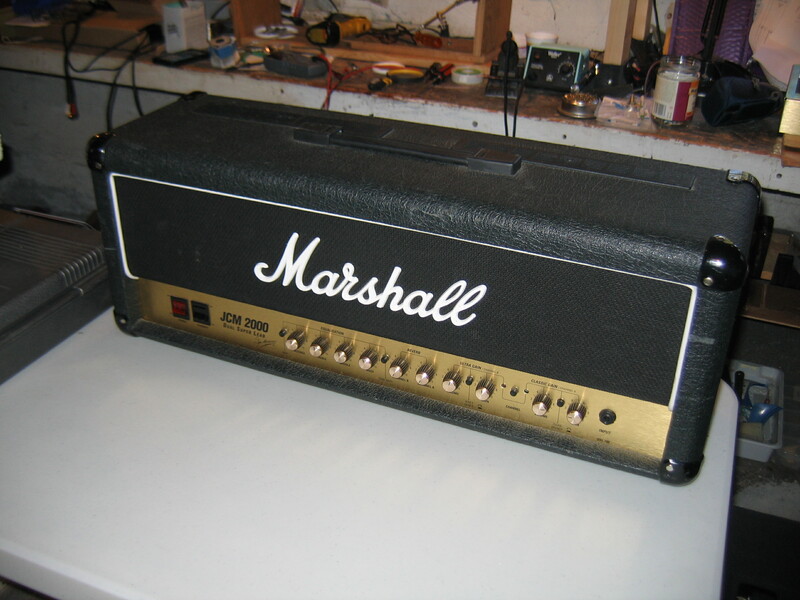 Today I had a 100 Watt JCM2000 in the shop for repairs. One of the power tubes wasn’t glowing – this means that the tube is not heating up to its operating point. A tube functions by heating a piece of metal so that it emits electrons. In order to do that you need a fair amount of current (~1A for a EL34, 6L6, etc) to flow through the tubes heater (or filament) circuit. 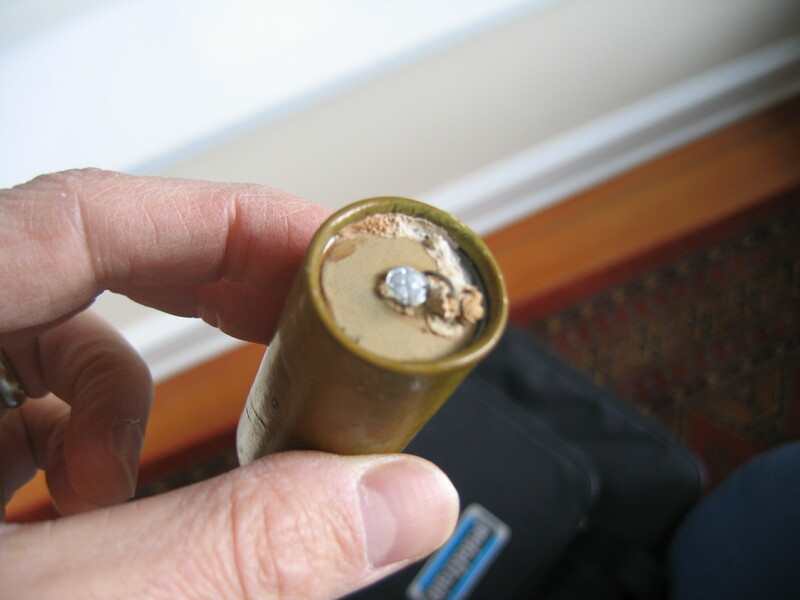 This Marshall had a poorly soldered printed circuit board that was causing the problem. Instead of a resistance of an ohm or so, there was 2500 ohms in-series with the tube socket – in other words, the solder joint had a resistance of 2.5K ! Now this baby is cranking, loud!! This is a 50W JCM 900 combo amp, a 2×12 cab. Two Celestion speakers of course! All four volume pots in this amp are bad. Cleaning them did not help. Going to put in 4 new volume pots. 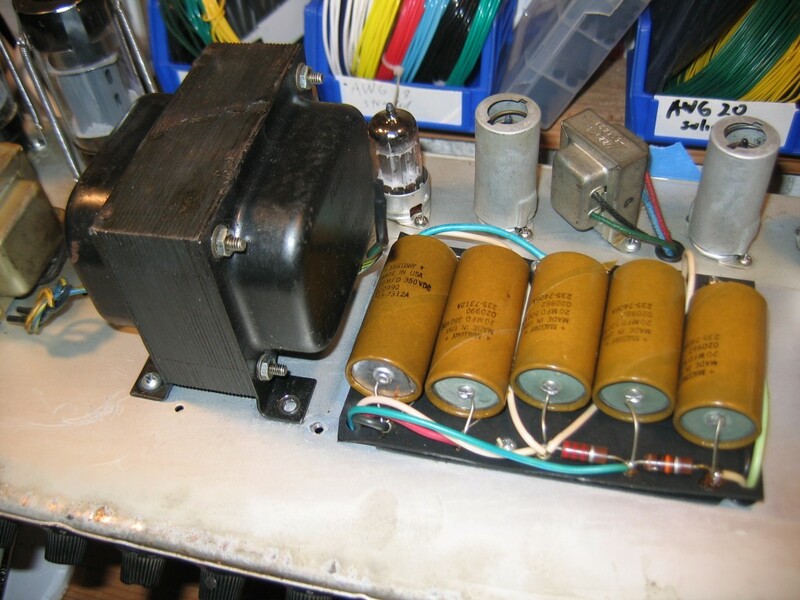 The amp is about 12 years old, so we’re going to replace the power supply capacitors as well as the output-tube bias capacitors. The large blue cans on the underside of the chassis house 4 of the main power supply filter capacitors. The top photo shows why replacing the volume pots is somewhat time-consuming: The pots are soldered to the preamp circuit board. In order to de-solder the pots (so you can remove them) you have to access the underside of the preamp board.